Tell us a little bit about yourselves - it's rare to come across a sister duo like yours! What's the origin story of Crossing Threads? We are sisters Lauren and Kass Hernandez, founders and artists behind the creative duo Crossing Threads. We create hand woven fibre art for private collectors and commercial spaces both here in Australia and internationally. Based in Sydney, we are first generation Australian-born and of Filipino heritage. Throughout our lives we have always been close siblings. Being only 13 months apart, we experience life with either one of us one step ahead, and the other closely following behind. Growing up, we both practiced dancing and performed as a dance duo at dance eisteddfods. Throughout our dancing years, we were constantly exposed to the world of costuming, frequently visiting fabric stores and watching our parents sequin and bead our costumes. You could say this was our introduction to fibre and embellishment. We both come from very different professional backgrounds; Lauren is a Senior Designer with Adobe Creative Suite being her toolbox and has worked in Advertising agencies for 8 years. Kass is Project Management Lead and works in the financial technology industry and has a 7 years experience of serving high profile clients. 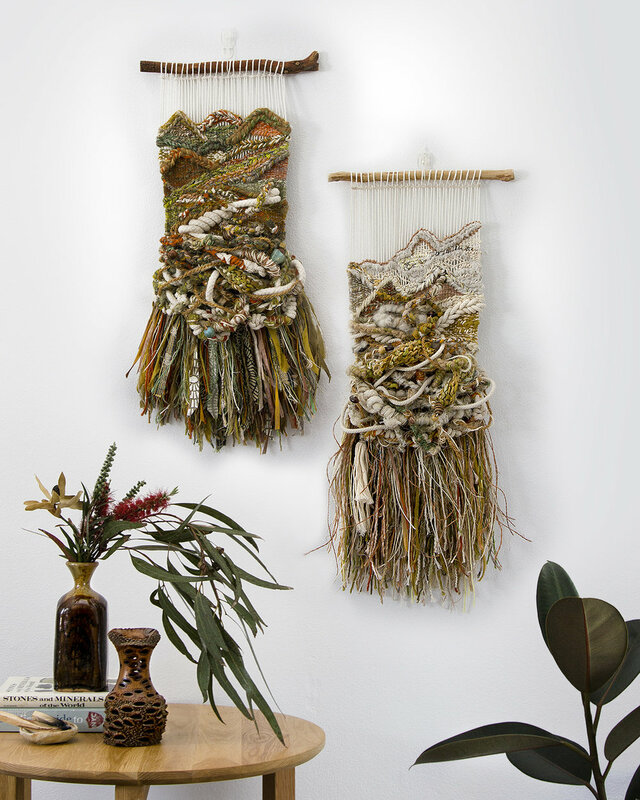 In early 2015, we both attended a weaving workshop hosted by artist Natalie Miller whom we were familiar with and practically caught weaver fever! In our spare time on the weekends, we would get together and learn new techniques and find “our groove".” One thing led to another and we decided to make this worth our while and create a proper brand and identity under which we would collaborate. Through workshopping our brand and what we stand for, Crossing Threads was born. Let's talk about your process a little bit. You use an abundance of unique, colorful, textured materials. Can you go into detail about how you source your materials? Our work is popularly known for being highly textural and intricate, the more texture the better we say! During the early stages of our creative practice, experimentation was key in developing our own unique voice and aesthetic. We have come to love natural fibres and always try to employ them in our pieces. They are simply much nicer to work with in our hands and offer a tactile, authentic finish where synthetics cannot. As part of our ethos, we aim to support Australian woolgrowers, and opt to use fibres supplied here in Australia by Aussie businesses. Most of what makes our textures unique is the use of various up-cycled materials we source, breathing life into the old and discarded. From scrap leather and upholstery to roping and clothing, we find a lot of joy in reworking these materials along with luxe quality fibres to create our highly textured pieces. It is really impossible to recreate a weaving, as the fibres combinations we have curated are truly one-of-a-kind and sometimes cannot be sourced again. In our efforts to reduce waste, we collect all of our scrap yarn and have it re-spun by a local spinner into bespoke yarn. It’s so great to see remnants of past weaves spun into a skein, which can then be used again in future work. It seems like sustainability is important in your work, since you have any fiber scraps re-spun so you can use them. Where did that passion for sustainability start? Yes, as mentioned earlier we collect our off-cuts and have them re-spun into bespoke yarn. The results are really something special because it is truly one of kind – you cannot purchase a skein like it anywhere else. Our consideration for sustainable practices came about from the very stage of sourcing our fibres and choosing to be more resourceful with what we end up using. Materials and fibres can be quite expensive if you don’t know where to look. We’ve found that up-cycling pre-loved clothing and upholstery samples and visiting co-ops have informed our creative direction and encouraged us to be more innovative with our designs and textures. It is our way of giving back and reducing our carbon footprint whilst also donating back to the community and charities alike. Describe Crossing Threads' aesthetic - what distinguishes you from other weavers? 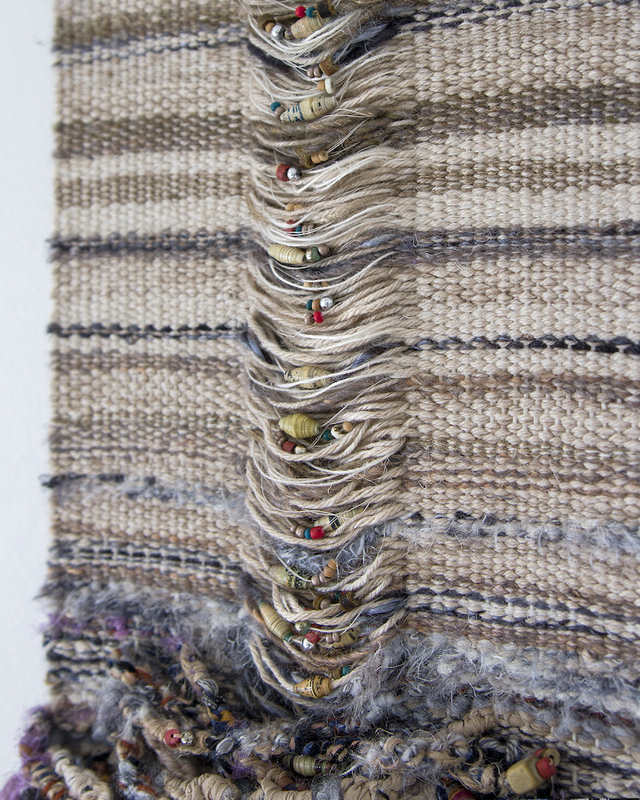 Crossing Threads is highly textural, organic and intricate. Not only do we use a mix of fibres and materials but we also incorporate found objects like foraged seashells, beads and gemstones. We believe as artists, it is important to find your creative voice which will not only make it more enjoyable and fulfilling to create but also set your work apart from what else is on the market. Most of our pivotal pieces have been created in response to a difficult time in our lives, an expressive release through fibre. Our most recognizable trait of our work is our “Interknot” technique, made up of intertwining hand knotted chains of varying texture and thicknesses. Every single piece of ours employs this technique, varying in colour and proportion. What's a piece that you're particularly proud of? Why are you proud of it? Kass: My favourite piece is our very first ‘ENTANGLED’ piece. This was created during a very difficult time in my life when I lost a dear family member. After a weeks of staring at a blank loom, I was overcome with emotion and made it a representation of the internal chaos that I was experiencing. Rooted with heavy chains that were intertwined at the bottom, the piece then grows and simplifies into a sense of relief that is demonstrated by the exposed warp at the top. This represented the need to surrender in vulnerable times and how we are all connected through the challenges we face in life. This is by far the most important weave that resonates with me till today and is also is the most popular design, that we have recreated for commissions on numerous occasions. Lauren: I am most proud of our piece titled ‘THE DIVIDE – XXL’. This piece is our largest piece to date and was a recreation of one of Kass’ original designs. It was created in a very stressful time, where we were both going through a lot in our personal lives. Coordinating together and organising the logistics of it all was a huge effort. Nonetheless, we’ve had the privilege of partnering with a fantastic interior design firm and had the opportunity to not only deliver the piece on time, but also were invited to see the piece in its forever home and experience it for ourselves. ‘THE DIVIDE – XXL’ represents the internal challenge of letting the light in; not letting negative energy engulf you, but through perseverance, there is always the option for a more beautiful state of grace if you choose it. This was more a spiritual lesson to me, more than anything. If you had to pick one moment from the past year that taught you something, what would it be, and what did it teach you? Kass: The lesson that took me the longest to learn was that you cannot please everyone and that by saying “no” to things that do not serve you, allows you to make room to say “yes” to opportunities that will serve you. This has helped us make decisions in navigating our career in Crossing Threads, whether it is to preserve our truthfulness or to prevent us from “burning out.” Weaving to practice meditation has taught me to not forgo our health, relationships or undermine the true value behind why we create, at the expense of your ego. Lauren: The success of Crossing Threads falls on how we work together as sisters above anything else. I’ve learned more about myself as a person and also about my closest friend for life, my sister Kass. Our relationship is what matters. The more we are working on a collaborative and harmonious level, the better the work is…it will bleed into it. You're not full time with Crossing Threads yet, but you've expressed desire to be someday. Do you ever worry that you'll make the leap and then regret it? Do you ever wonder whether making your passion full-time will turn your passion into just another stressful job? This year we have decided to take Crossing Threads to the next level and give it more time and attention to grow. Lauren has left full-time work and is now in the transition of working part time as a Freelance Designer and part time at Crossing Threads. Kass will be taking a 6-month sabbatical this coming October where we plan to amp up our efforts in scaling the business and creating more work. If not now, then when? There has always been fear in taking this leap, but we have faith in the “fierce trust”: doing something where the words ‘failure’ and ‘success’ become irrelevant. Just doing it matters. We have constant conversations about returning back to the “why” – the purpose of our work and why it serves us. What we aim to achieve is a sustainable relationship with creativity, one where we don’t compromise our health, our relationship as sisters and our relationship with what is truly authentic to our art practice. What have you learned about your relationship with each other since starting Crossing Threads? We have to remember to separate our personal relationship from our working relationship. To see each other as business partners first. It’s difficult to shift this mindset, but we’ve learned that strong communication makes it so much easier to navigate this dynamic relationship, as we are both learning new lessons and new ways of thinking. Check the sisters out on Instagram and their website. And check out their Ten Facts feature here.